Toktogul's mother was a professional composer of laments (koshokchi). Reportedly a master komuz player (komuzchu) by the age of twelve, Toktogul was making a name for himself as a spontaneous topical composer-singer (akyn) just six years later. But his songs featured pointed criticisms of local beys and would earn him a dozen years of imprisonment and exile. While Soviet- era interpretation of Toktogul's czarist-era trouble-making songs depict him as a hero of class struggle, 'revisionist history' suggests it was more a reflection of Kyrgyz clan rivalries. The official viewpoint was voiced by Soviet musicologist Viktor M. Beliaev (Central Asian Music, Wesleyan University Press, Middletown, Conn.): "...the development in the pre-revolutionary period of a progressive democratic tendency in the area of the akyns' art reached a high revolutionary pathos in the works of Toktogul." 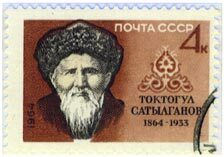 The near-canonization of Toktogul in the Soviet era reflects a shrewd understanding by the Russians of the akyn's important role as shaper of public opinion in traditional Kyrgyz society. Toktogul's `revolutionary pathos' was a propaganda windfall for the Soviets. If recent history has mooted the political value of his songs, the continued ubiquity of Toktogul's compositions among Kyrgyz traditional musicians and singers suggests that the qualities praised by A.V. Zataevich, the Russian transcriber of Toktogul's compositions--"striking originality, subtle musicianship, breadth of phrasing and melodic freshness"--still inspire. 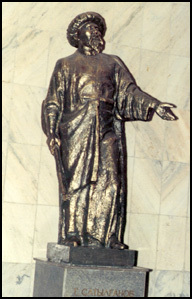 Toktogul's advice to his disciples: "Serve eternal truth, akyn!" Click to hear "Kerbez" (Song About Old Age) performed by Nurak Abdïrakhmanov -opens in its own small window.